Boston Acoustics A-25 review | What Hi-Fi? 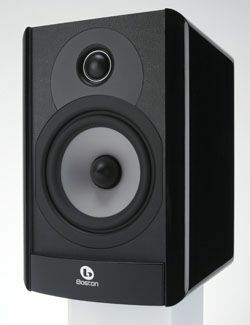 The A-25s are the first of a new three-strong range of Boston Acoustics standmounters to arrive in our listening rooms. It’s safe to say the smaller A-23s and the larger A-26s have a high standard to maintain when their time in the spotlight comes. Compact and slightly curvy, the Bostons are fitted with magnetic grilles and are expertly finished in a curious mixture of modern (high-gloss black) and old-school (leather-effect vinyl) materials – the effect is a bit like seeing you Granny in a pair of Air Jordans. The A-25s feature a 25mm soft-dome tweeter and 13cm mid/bass driver at the front, with a reflex port at the back along with a multi-directional eye to facilitate wall-hanging. They’re fairly relaxed about room position, and can (at a push) be considered realistic wall-hanging candidates, but sound their best in a little free space and, inevitably, on some dedicated speaker stands. And their best is impressive. Peppy but not overenthusiastic, open but nicely focused, the A-25s sing with a poised, uncluttered voice that does full justice to the likes of First Aid Kit’s When I Grow Up. There’s well-judged bite at the top end, balance and confidence in the midrange, and enough tonal variation at the bottom end to compensate for a slight lack of out-and-out substance. The entire frequency range is well integrated, and there’s a fine sense of performance from the Bostons – even the most complex recordings enjoy a unity of tonality and presentation that’s by no means a given at this price point. Rapid transients present no problems, dynamic upheavals are dispatched without alarms and timing is more-than acceptable too. Sensibly, the A-25s never sacrifice their self-possession in a quest for excitement – we can think of only one comparably priced rival that does a better job of combining vigour and smooth listenability – and as a result they’re a pretty compelling option.